One of the things that can cause big conflicts in a relationship, particularly where there is a child with special needs, is differing styles of parenting. We've had our own issues in our home, so I thought I'd share a few of my thoughts and hope you can contribute what's worked for you if you've had similar issues. However, when children come along, it's our different styles of parenting, often learned from our own parents (especially discipline), that can cause major issues. Add to this having a child with a disability and it can throw things into sharp focus. Should you go easy on them? Should you treat them the same as any non-disabled children? What different expectations of behaviour should you have? Because of the changes having children has on your relationship, it's a good idea to incorporate lots of flexibility, humour and honesty on your journey. These are, in my opinion, an essential ingredient when dealing with differing parenting styles. Listening to each other is equally as important and respecting that your partner's viewpoint isn't necessarily wrong just because it's not the same as yours. It's good to openly acknowledge that you both have different approaches so that you can build on what is even more important - your common ground. I also think (and have experienced) that when a difference in parenting style is causing difficulties throughout the family, ignoring it won’t make the problem go away. It is something that needs addressing when all is calm. Definitely don’t wait for a situation to escalate when no one is in the listening mood before deciding to deal with it. The statistics show that separation and divorce are much higher if you have a child with SEND, so I thought I would compile some top tips on working together and staying together. I'd be delighted if you could add any of yours to the comments at the bottom of this blog. Appreciate the differences you bring to your parenting. Instead of seeing things as a right or wrong way, look at each other’s styles for their strengths. When you're calm, sit down and discuss potential clash points as this will allow you to learn more about how you both parent. Remember you are both in this together - maybe write that down on a piece of paper and have it on the table in front of you so you don't forget during the discussion. Don't leave talking until there's a problem. If one of you feels undermined, explain what it is that you feel isn’t working for you and why. The heat of a situation isn’t the time or the place as it’s likely you are emotionally charged and unable to hear each other. Give yourself time and space. If you need five minutes to walk round the block, take it, and tell your partner that is what you are doing. Remember you are both adults and it takes two to continue an argument. A person cannot argue with themselves! Agree over discipline: If you disagree over how to discipline, decide in advance what you feel is the best way forward for your family and remember these will take time to learn and put in place. You will both make mistakes and that is okay as long as you leave out the blame. 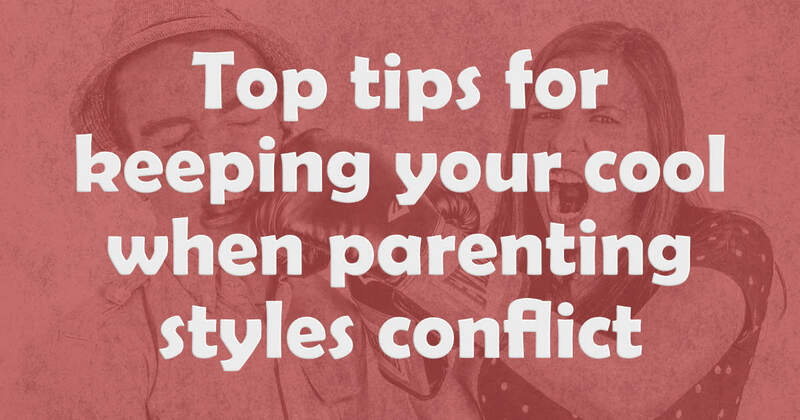 Agree on what are the most important points and behaviours that you need to stop or address and write up your family rules together or even as a family. Specialist courses: Consider training courses for parenting children with a disability. Many parents can initially face the equivalent of a kind of 'loss' of your expectations of parenthood that need to be processed. You may find that you are at completely different stages of this process and that in itself can be a huge barrier to accessing support – See Kubler Ross’ theory on loss to help you understand where you or your partner may be at just now – Understanding this can help you understand each other a little better. Crossing barriers: If you've been on courses to learn techniques and strategies but your partner continually ignores them, try to find out what their barriers are. It might seem unfair that you are ‘doing all the work’, but this is in the interests of your child and your family unit. Extra work now could pay dividends in the long run. I have personally experienced this and in the beginning it was immensely frustrating and at times I wanted to give up, I really did. Find someone to vent with if this happens to you. I stuck with it, cried, vented, swore, threatened divorce, you name it, but, now with perseverance we muddle along, still making mistakes but it’s working. I remembered, as above, that my view is just that - my view. Pick your battles: Ensure that what you decide in your family rules are actually worth the effort to implement. Is it absolutely necessary that you all sit at the table to eat? Or that the knife and fork are used ‘correctly’ or that you all attend a family event (especially if noisy and there are unfamiliar people in attendance). Put up boundaries: Discipline is important. Making allowances is often an integral part of parenting a child with additional needs but they still need boundaries. If they are doing something at eight years old the potential is that unless the boundaries are set, they will still be doing it at 18 years of age. What is endearing at eight years old could potentially be completely inappropriate at 18 and needs intervention (seek professional support if necessary) For example, my growing ASD son still feels it is appropriate to greet everyone with a hug and a ‘hello my love’ to anyone he meets. We've explained (verbally, or with a visual cue or a social story – whatever might work with your family) that this is not okay and are teaching him that a high-five or a handshake is preferable now he's becoming bigger. Hopefully this will prevent him from heaps of trouble when he is a young man. Remember your sense of humour. All to often it is easy to lose sight of who you are and with that comes the feeling that life is an uphill struggle. I’m not suggesting for one moment that it isn’t tough – we know it is – but remember to find things to laugh about, to have fun and to smile. Let's face it, sometimes the things our kids can come out with are just funny! Don’t take yourself too seriously. I used to do this all the time, feeling awkward about life and myself. It took time to learn, but I gradually managed to laugh at myself and my mistakes. I've learned it's okay to be human and by acknowledging my mistakes, I was able to learn so much more about myself. Consider some coaching or counselling if this something you feel might be tricky. Remember love: Remember why you and your partner got together in the first place. What was it that attracted you to each other? Is there the potential to be able to find that again? Often when you have a child with special needs in your family, there is more than the average sense of guilt felt. 'What if’s' are abundant, 'if only’s' feature quite highly too. Shoulds, coulds and woulds are often there too. Drop them, they are not helpful and don’t change anything. Guilt can be a huge happiness barrier and prevent you from enjoying the here and now and enjoying each other. Is that happening to you? If so seek support either from each other or from a professional. It is never too late! Autism Hero Awards: A win for SNJ! Great post. I would add maintain a united front with discipline whilst knowing there are times when you both agreeing to play good cop bad cop will also work well. Thanks Sam and great comment too. Keeping united where possible is crucial much of the time. Absolutely – That can be a very difficult situation to manage and can be where good outside support is paramount to help the relationship survive, or, of course, other choices regarding the relationship might need to be made in some cases! Loved this right up until after point 12 😉 😀 Seriously, great list and yes, humour is key! !